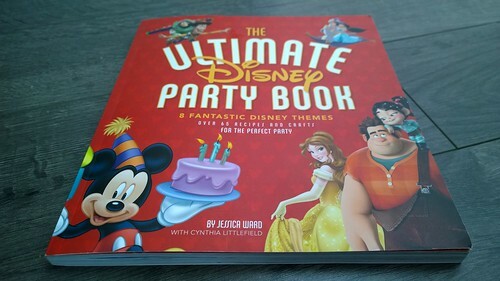 If you have young children and you like to throw themed parties, The Ultimate Disney Party Book is a MUST HAVE party planning book. It contains a collection of the most clever and attractive themed invitations, decorations, foods, games, activities and favors to throw eight different Disney-themed parties in one beautiful paperback book that is easy to flick through, follow and be inspired by. Since we don’t have any birthday parties to plan soon, I decided for the purposes of this review to choose one food item and one decoration/craft project to make to see how easy the instructions were to follow. As we looked through the beautifully staged pictures of adorable treats, I couldn’t help but notice how much wheat, animal products and sugar are involved in most of the recipes. As a gluten free veg mama, I actually struggled to find a recipe we could make that fit our diet (besides The Little Mermaid-themed cut melon on a stick). That said, I could see the potential to adapt several of the recipes to fit our diet. 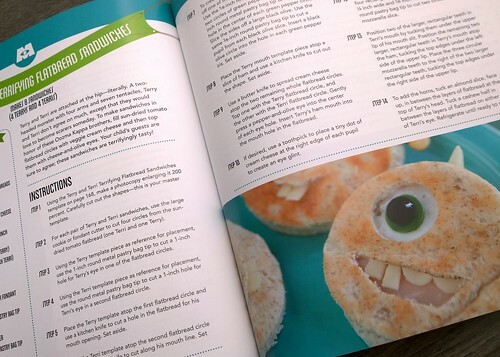 So for this review, we opted to adapt the Cheesy Wheezys stuffed olives recipe (p. 60) from the Monster’s, Inc. theme. 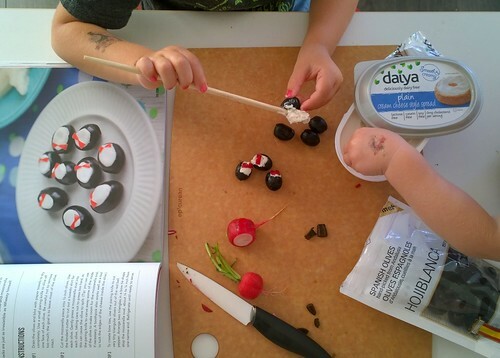 Our olives were likely not as large as those in the book, we used soft vegan cream cheese instead of the mozzarella balls suggested, and we used slivers of radish for the bow ties because we didn’t have a red bell pepper or fondant cutters. 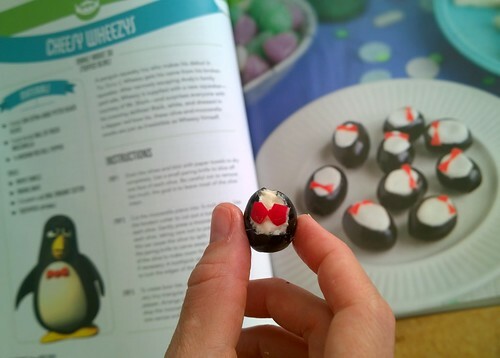 But all told, our little olives turned out almost as cute as those in the book and they tasted great. With both girls helping, it took us approximately three minutes to make each olive, so at that rate we would have needed hours to make a party platter. Ha! Choosing which craft to do was tough because everything looked very cute. I wanted to choose one of the crafts that had a stencil provided in the back of the book and that didn’t require a lot of new supplies from the craft store. 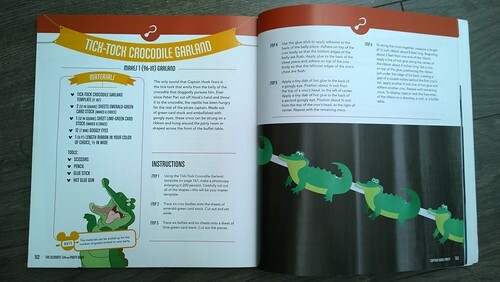 The girls are learning about crocodiles this week so we thought making the Tick-Tock Crocodile Garland (p. 152) from the Captain Hook theme would be perfect. I used our home copier to enlarge the stencil to 200%. Cutting just the one crocodile out, with his intricate toes and zig-zaggy back was a little tricky. It’s such an adorable finished product in the picture, but holy cow, it would be a lot of work to cut six or more of these crocs out to make the full garland. If you choose to throw the Captain Hook-themed party, I suggest outsourcing this cutting job to a crafty grandma. So after I cut out the stencil, I thought about how we could use it to make just one really cool crocodile instead of a garland of six crocs. And then I looked at all the finger paintings my two year old has been whipping up and I decided to trace the stencil on them to create a neato layered painting. 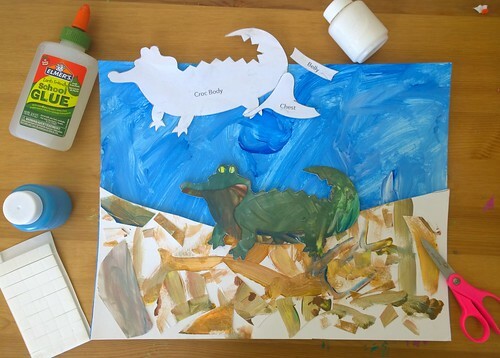 I employed my three year old to paint the swirly blue and white background on a sheet of stiff cardstock while I cut out the green croc. To help the crock stand out from the background a bit, I used a few squares of two-sided sticky foam to raise it up 1/16 of an inch. 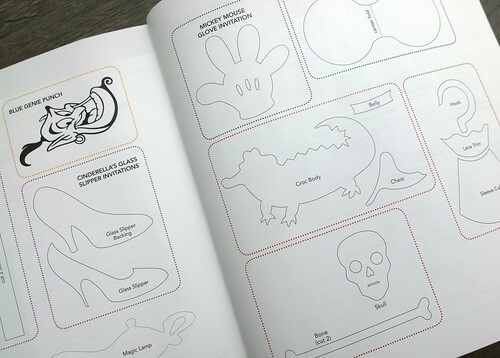 With this deviation from the party garland project, I think we prove The Ultimate Disney Party Book doesn’t just have the single purpose of inspiring and guiding themed party planning. It could also be used to inspire everyday craft projects. 1) While the finished products look amazing, some of the projects take time to make and/or require special craft or baking supplies. If you have a fully-stocked craft room, you’ll be ready to roll on these. But for a mom like me that considers a pair of scissors and a bottle of glue as her “craft supplies,” some of these projects look overwhelming. 2) All but one of the party themes is focused on a specific movie or franchise (Toy Story, Monsters, Inc., etc) and they totally capture the personalities that we love in each of the stories. The Princess Party, however, is a theme that lumps all of the Disney princesses together which doesn’t do any of the individual characters justice. The Rapunzel hair garland (made out of yarn and flowers) is REALLY cool, but the rest of the princesses are loosely represented in the theme. So in the end, I feel that compared to the seven other amazing party themes, the Princess Party theme falls a little flat because the characters themselves are not well represented in the shoe invitation, tiara craft or gummy bracelet favors. 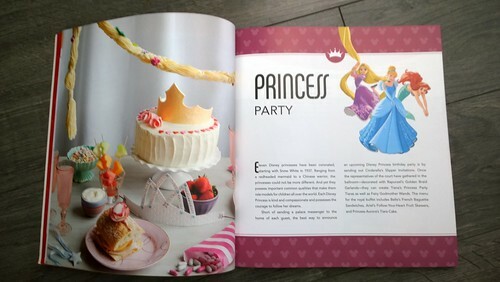 I would love it if the authors of this book made an entirely Disney Princess Party-themed book that gave each princess a separate party to capture what we love most from their respective stories – their unique personalities, the poison apples, the Elinor Bears, and the singing broken tea cups. Overall, however, I love this book. It offers so many fabulously creative ideas for pulling together great Disney-themed parties. I enjoyed reviewing it and look forward to putting together a Disney-themed event for our next birthday. What an awesome book! I love the monster sandwiches 🙂 I can imagine it would make for a great theme party! I think I’m going to be needing this book for years to come. My girl loves all things Disney lately…..
She would love a princess party! My son and I would really enjoy making some things out of this book together. The Hidden Mickey Scavenger Hunt sound like a lot of fun! Any book with Disney characters in it is definitely a fun book and great for a collection. I think this recipe book is fun and I love the olive recipe. Looks like the book contains some great ideas… I will have to pick it up. Thanks! I would recommend this book to any Mom who has children in love with the Disney characters. I read Allison’s post and was very impressed with how well she described the pluses and minuses of it. Thus said, it would still give a Mom time to plan a Disney -Themed party is she was so inclined and make her child a happy Disney fan. wow this is so awesome , so many awesome tings to make an do .. thanks for sharing your awesome review , will def be looking out for it ! This book sounds amazing and so full of ideas! This sounds like such an amazing book! I’m definitely getting this for my niece! This book would certainly come in handy if your children love Disney (so do I) and want to have a theme party. Ever thing is available for eight different theme parties. I could have used this book many times over. Thank you for this informative and helpful post. I did a serious reread of this post and am wondering if I can buy it at our local bookstore. I love the post Allison wrote and showed how to improvise. Thank you so much for this information. I am a handy grandmother and would not mind cutting out crocodiles or anything else.